Before meeting my girlfriend I hadn’t ever tried Spinach Dip, but she is in love with it and I’ve now eaten it many times at home or with an appetizer when going out for dinner. When I first tried it I was curious how healthy it actually was, as the name “spinach dip” sounds like it would be a healthy food. I’m sure many people are wondering if Spinach Dip is actually healthy so I thought I would take a look at the ingredients and nutrition information. Firstly I will let you know that, no, unfortunately Spinach Dip isn’t healthy. This is why I try to keep it to my cheat days only. Although it isn’t too healthy, there are some healthier versions of it that aren’t awful. The kind we usually buy is the PC Blue Menu Spinach Dip, which actually isn’t all too bad. The main ingredients is yogurt, but that is followed by mayonnaise and sour cream. The actual healthy spinach isn’t listed in the ingredients until pretty far down, which shows you that there is very little spinach compared to the unhealthy ingredients such as mayonnaise. 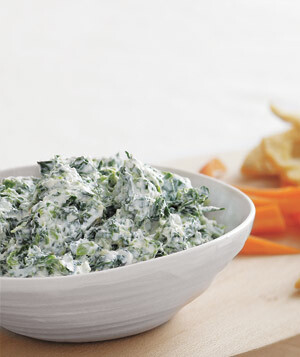 In their version of Spinach Dip a serving size is 2 tbsp and that contains 70 calories with 6 grams of fat. Now I’ve checked online for other versions of Spinach Dip and came across Kraft Foods recipe for Spinach Dip using their “Miracle Whip” mayonnaise. The ingredients include sour cream, mayonnaise, dry vegetable soup mix, cheese, some spinach, and a few other ingredients. There aren’t any nutritional facts on the recipe page, but I can tell you that this version is less healthy than the Spinach Dip I mentioned earlier. My guess would be maybe 100 calories per 2 tbsp. No 70 and 100 calories don’t seem that unhealthy, but you have to realize that first of all you will probably have maybe 4 or 5 tbsp (or more) when eating Spinach Dip. So you are looking more towards 200-300 calories (almost all which are unhealthy calories). On top of that you are probably dipping crackers, bread, or pita bread into the spinach dip. Add those unhealthy carbohydrates into the mix along with the added calories and you are looking at a snack or appetizer that is going to put on the pounds. Be careful: Spinach Dip sounds healthy, but really has very little nutritional value. Keep it to your cheat day or cheat meal and try dipping vegetables into the dip instead of crackers, bread, or pita.